1.1 billion active users for Google Search (74.5% market share and 3.5 billion searches a day or 1.2 trillion searches a year!) I’m not surprised! I probably do at least 100 searches a day myself. Traditional media cannot tell you what was successful and what wasn’t. With digital media, you can track how many times someone saw and clicked an ad, whether they engaged with it, if they called your business after clicking, if they filled out a lead form and if they completed a sale on your site after clicking. This data is great for measuring success and ROI, and it gives you important information about what works. Getting these insights is the holy grail of advertising. This data gives advertisers the ability to quickly learn how to improve campaigns over time and provides a better opportunity for generating results. You can rarely compare ad “A” to ad “B” with traditional media and there’s really no way to gather actionable insights. Traditional advertising is just shooting in the dark hoping to hit the target. 3. Effective at Generating Results. There’s an endless supply of studies from every industry under the sun claiming that their platform or medium is the best for…fill in the blank. If the cheese industry starts shouting, “Cheese is the next superfood” red flags should be going off in your mind. So instead of sharing any random stats out of thousands, I figured the best way to illustrate the effectiveness by platform would be to look at the overall spend and trends by medium. 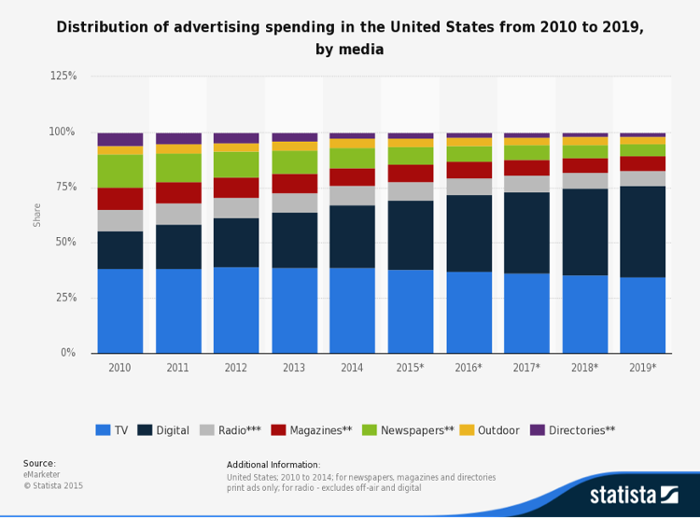 2010 digital spend accounted for about 17% of total ad spend while TV was around 30%. Fast forward to 2018 and digital is predicted to eclipse 42% of total spend and about 45% of total ad spend by 2019. TV spend is predicted to drop drastically and sink down to about 33% of total spend by 2019. All other platforms also look to be trending quickly downward except Outdoor or Billboards which appears to have remained virtually untouched by the rise of digital. 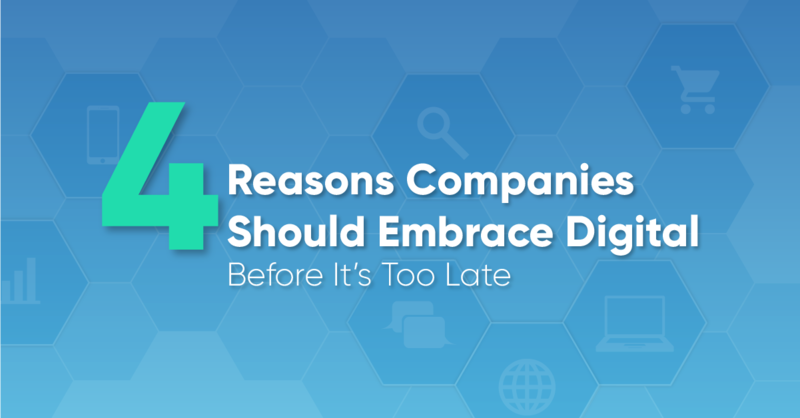 One of the biggest mistakes we see companies make is refusing to adapt to the changing times and continuing to do things the same way they always have. They fear change because they don’t understand it. This is exactly how Borders (Books), Toys R’ Us, Polaroid, Blockbuster, and Kodak went out of business. They failed to innovate or adapt to the changing times. Sadly, with the rise of e-commerce we are seeing more and more businesses failing every day. Society won’t be abandoning digital platforms anytime soon and most people are going to continue adopting new technologies. The mobile phone has already disrupted many industries, not to mention the way we live. Just over the digital horizon are voice, the internet of things and AI. If you continue to ignore digital advertising and fail to incorporate it into your marketing budget, you could soon find your business being left in the dust. If you want to embrace digital marketing, contact us and we can get started.